It is hardly surprising that Charles Heaphy (1820-81) excelled from an early age at painting and cartography, since he came from an artistic, well-connected, London family. His father was a professional watercolour painter and miniaturist attached to the staff of the Duke of Wellington. At 15, Charles began his working life as a draughtsman for the London and Birmingham Railway Company. Two years later, he joined Edward Gibbon Wakefield’s New Zealand Company as an assistant surveyor. He was part of the company’s first exploratory team, arriving in Marlborough Sound, aboard the Tory, in August 1839. He travelled around a lot during his early years in New Zealand, including gruelling expeditions across the South Island wilderness into regions never before seen by Europeans. During his travels, Heaphy painted a series of watercolour scenes that rank among the finest art from New Zealand’s early colonial period. The Heaphy Track in Kahurangi National Park is also named in his honour and attracts trampers from all parts of the world. 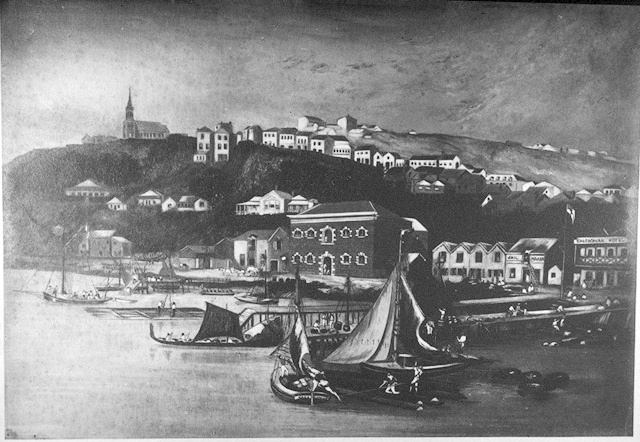 Heaphy moved to Auckland in 1848 and got a job in the survey office of the colonial government. 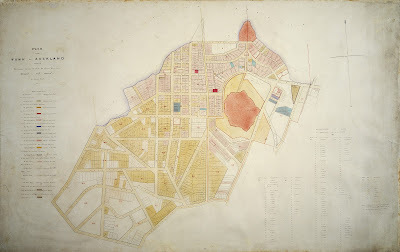 He remained in the city for four years, during which time he married the daughter of prominent Auckland clergyman John Churton and, among other assignments, drew up the plan shown below. Thought to have been commissioned by Auckland landowner and merchant William Smellie Graham (see p.86), Heaphy’s 1851 town plan provides a detailed breakdown of Crown Grant purchases up to that date. The name of the purchaser is inscribed on each allotment, but keen eyesight is required to decipher Heaphy’s tiny lettering. An index of purchasers is included on the right and an explanation of the colour coding on the left: ‘The Pink Tint indicates lands that have been sold for cash. The Green Tint indicates land which has been sold for Public Buildings. The Yellow Tint indicates land which has been sold for scrip. The Crimson Tint indicates lands which have been sold for retiring officers'. Auckland has expanded vastly since Heaphy’s time and many streets have come about, changed name, disappeared or changed in structure. Coburg Street, for example, is now Kitchener Street and Customhouse Street is now simply Customs St. The large scarlet-stippled area to the east that Heaphy designates ‘barren ground’ is now Albert Park and the University of Auckland. Still, much of the central business district in the plan is recognisable to modern Aucklanders. Heaphy's career later on was unusually diverse. He was, at various times, a goldminer, geologist, soldier (awarded the Victoria Cross for gallantry in the field during the 1860s Waikato war), parliamentarian, commissioner of native reserves and judge of the native land court. He moved to Brisbane a few months before his death. Heaphy’s manuscript map is owned by the New Zealand Insurance Company and has been entrusted to Auckland Libraries for safekeeping. It is cared for along with a great range of other Auckland maps in the Sir George Grey Special Collections. You can search for these maps in the Heritage Images database by going to the Advanced Search page, entering Auckland into subjects box and ticking the Maps only box.